Studio, Studio + Convertible bed(s), 1 Bath, (Sleeps 2-3). 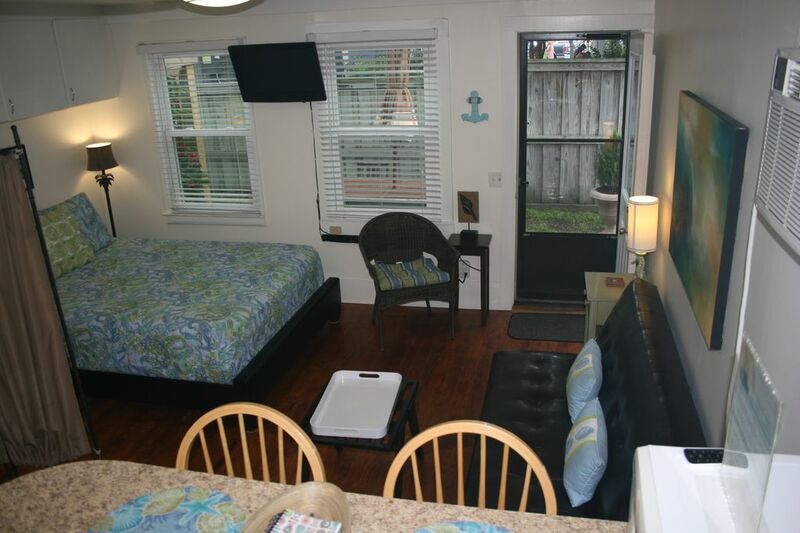 Efficiency Apartment located in the Heart of Wrightsville Beach. This apartment has been completely remodeled. It is a great get away for a couple, small family, or even a few friends. This apartment has hardwood floors and all new furnishings. It is on the ground level. You can relax on the patio or walk around the side and walk just a few steps to the ocean or walk in the other direction to the downtown area. You do not have to cross any streets. It is convenient to all local restaurants, local grocery store, pizza parlor, surf shop, ice cream parlor, coffee shop and more. You can enjoy the 'walking loop' which is just a few steps away to begin the 3 mile walk around the island for exercising or just pleasure. The pier is just a short walk down the beach for fishing or fun. This apartment has all the amenities of home and the private area that make it just a quiet relaxing fun place. This apartment building has been in our family for many years. It is one of the few old beach houses that remains. We have remodeled a little along still keeping the charm of the 'old' beach feeling. This apartment has a wonderful back outdoor setting. Table and chairs with large umbrella to keep out of sun. The area has a wooden fence for privacy. You have a wonderful view of the ocean and the area. It is located on a safe and fun street. Everyone is friendly. Just a nice, quiet, relaxing place. Approximate square footage is 275. Stand-up shower only. The base is large enough to bathe a small child. The beach is a short walk to the right about 150 feet. There is a life guard stand on the beach to the right. The life guards are out from Memorial Day - Labor day. We have a nice clean beach. The downtown area of WB is about 150 feet to the left. There are surf shops, restaurants, gift shops, pizza, ice cream - "the downtown WB"
The ocean is a short walk. Approximately 150 feet to the sand. Just right down the side of the building and you can see the sand. You can also see from the back patio but this area is blocked by trees. There is a air/heat exchange unit in this apartment. There is an air/heat exchange in this apartment. Wifi is available. Instructions are in the apartment. We supply hand towels, hand soap/dish soap, sponge, a roll of paper towels and 2 rolls of toilet paper. There are quilts on the beds with a mattress pad. Instructions for connecting are located inside the apartment. Small studio couch and chair with TV and DVD player. Coffee Maker is in the apartment. You can walk down to the end of the street and enjoy a cup of fresh Joe at the coffee shop. Dishes and utensils are furnished in the kitchen. Kitchen is fully furnished ready for the cook!! Gas stove, refrigerator, microwave. The stereo is mounted under the cabinet in the kitchen area. There is a grassy area in front of this apartment that you can keep your bikes, small kayaks, etc. Outside area with chairs for enjoying the salt air and relaxation. Outdoor shower with both hot and cold water for using to rinse off when coming in from the beach. Shampoo and conditioner available for showering off. Outside sitting area for relaxing after a day or recreation. Terrific proximity to the beach, restaurants, etc. with a friendly full-time family upstairs. Excellent Pizza, Tex-Mex, Seafood, & Ice Cream quite literally a stone's throw away. Thank you Clay, we'll be back. Comfy, small studio apartment. Good location, close to the beach, bars, and restaurants. Extra charge for linens, so bring your own or be ready to pay. Nice property with lots of hidden costs (very high for off season) and Noisy appliances. The list price had an average /night that to start with was among the lowest. The price climbed by the end 2.4 times /per night from price posted, and it's "off season". The hidden part was the very high, per night linen fee . It was not included originally, then came the contract with an amount that by that time had doubled per night so I assumed the linen fee was included. Then when I got the final arrangements which was quite a bit after the amount had been paid, I was informed to bring cash or check for the linens. It was to late to back out or I would have because it brought the cost to 2.4 times the average per night cost. The place has a great location and is clean, but in order to be comfortable the AC and dehumidifier have to run constantly, they are very loud and the dehumidifier needs to be emptied a couple times a day. Good luck sleeping. The couch is also old and out of shape, the seat is not in any way a comfortable place to sit. So when you return and are looking for comfy place to relax, there isn't one. One last thing, any clothing you hang in the closet or place in drawers will have a strong musty smell. The unit is great! It has everything you'd need. You feel at home when you open the door. The location is perfect: a short walk to the beach if you go right and a short walk to restaurants and shops if you go left. A nice patio with a picnic table just by the unit. The hosts are kind and gracious! This was the best property in my opinion! Location is perfect, walking distance to food, drinks, beach. House had everything we needed. Short Uber right to downtown Wilmington if you want more options, but we never left the beach! Cosy and neat, right by the beach, and around the corner from coffee and amazing burritos at Tower 7. Owner was great to work with and the little place had everything I needed and more. Next time I will plan to cook more - nice full kitchen! Walking LOOP-3 miles around the island for great exercise and pleasure. There is a park that has a playground, etc. The fishing pier is a short walk down the beach to try your luck at catching a fish or just observing. You can go paddle boarding with a group that meets on the sound side. Go down to the river walk and visit historic Wilmington. Battleship North Carolina is located a short drive away. CLEANING FEES ARE INCLUDED. I JUST ASK THAT YOU TAKE THE TRASH TO THE CANS AT THE FENCE AND PUT ANY USED KITCHEN TOWELS IN THE BASKET. Monthly rates available in OFF SEASON - call for information.